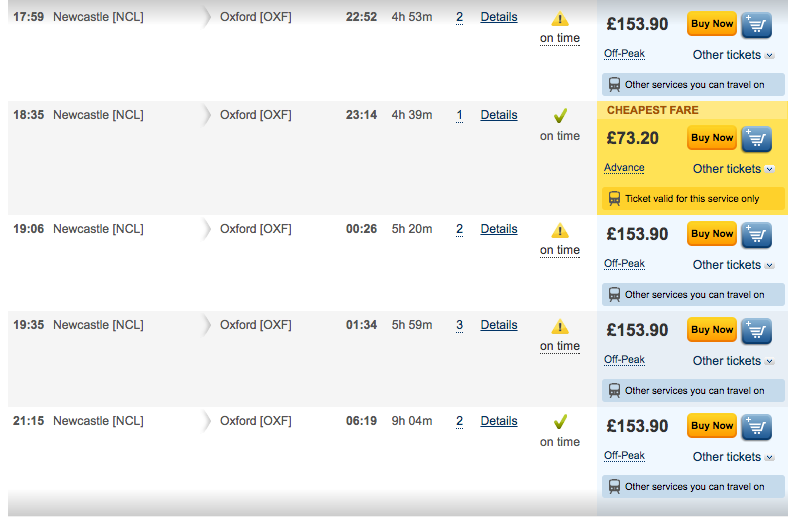 It's a mark of how absurd the trains are in this country that you can also save money by splitting up your journey. E.g. instead of buying a ticket from Birmingham to London, for instance, you buy one from Birmingham to Rugby, and one from Rugby to Birmingham. The ticket inspector will hate you, but you'll save a few quid. Well, now the trains have hit peak absurdity. This guy was advised by his friend that he could save money by splitting his ticket. But it turns out the only way he could save money on the ticket was to split it up into 56 individual tickets, and now he feels like a melon. Jonny was traveling to Oxford from Newcastle, which is quite pricy. So it's easy to see why his friend Lee advised him to split his tickets. By splitting his ticket up into 56 individual tickets, he managed to save £50, as well as piss off the train inspector. By splitting his ticket he saved two thirds of his costs but stayed on exactly the same train as everyone else who paid extra. But he says it wasn't worth it due to the embarrassment of having to carry around 56 people's worth of tickets. Or this guy, who pays to sit in a cupboard.